Our range of White Knight tumble dryers have been designed with the modern home in mind, ideal for both big spaces and compact homes. They not only look sleek but offer practicality and excellent drying quality, and all models come with a one year manufacturer’s warranty to give you peace of mind. If you’re wanting to save money on your energy bills then a spin dryer, as opposed to a heated White Knight tumble dryer, offers a good alternative. Removing around 50% more water than a washing machine’s spin cycle, White Knight spin dryers have a good capacity and are extremely compact. 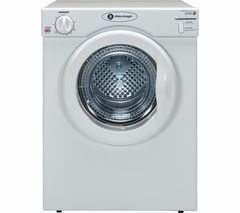 Each heated White Knight tumble dryer comes with a range of settings, such a variable heat so you can go easy on your clothes when you need to, as well as an extra long timer so you leave your machine to do its work whilst you get on with your day. Keeping your tumble dryer fluff free is important, and impacts on its effectiveness, so the easy access fluff filter on White Knight tumble dryers means you can easily keep your dryer free of fluff and operating at maximum capacity. Models come in a variety of sizes, and if you’ve got a fitted kitchen then an integrated model could be perfect for you. If the White Knight range doesn’t have quite what you’re looking for then take a look at our Hotpoint Tumble Dryers, which offer excellent energy efficiency and come in a variety of styles and colours. Our Bosch tumble dryers all come with a two year warranty, with many larger models having up to a 9kg capacity, making them perfect for a family home.